Human error is here to stay. This perhaps obvious statement has a profound implication for society when faced with the types of hazardous system accidents that have occurred over the past three decades. Such accidents have been strongly influenced by human error, yet many system designs in existence or being planned and built do not take human error into consideration. 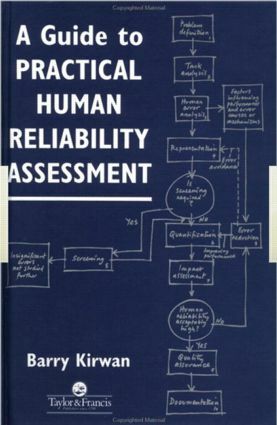 ; "A Guide to Practical Human Reliability Assessment" is a practical and pragmatic guide to the techniques and approaches of human reliability assessment HRA. lt offers the reader explanatory and practical methods which have been applied and have worked in high technology and high risk assessments - particularly but not exclusively to potentially hazardous industries such as exist in process control, nuclear power, chemical and petrochemical industries. A Guide to Practical Human Reliability Assessment offers the practitioner a comprehensive tool-kit of different approaches along with guidance on selecting different methods for different applications. It covers the risk assessment and the HRA process, as well as methods of task analysis, error identification, quantification, representation of errors in the risk analysis, followed by error reduction analysis, quality assurance and documentation. There are also a number of detailed case studies from nuclear, chemical, offshore, and marine HRA'S, exemplfying the image of techniques and the impact of HRA in existing and design-stage systems.